I guess by now you’ve realized I have BABY on the brain and with an active (hungry) toddler and a baby on the way, I also can’t help but think about nutrition. What am I feeding Aiden, what am I putting in my mouth for this Little One on the way, when should we start freezing baby food (lol…probably too early for that!). When Aiden started on solids, I used a lot of fresh foods that I would just mash up and serve him. He was a huge fan of apples, pears, and sweet potatoes. I also relied on organic jarred foods as well, but with an easy system like Munchkin’s full fresh baby food system, I think we’ll be able to stick with all homemade baby foods this time around. With our new system, I’ve made homemade apple sauce, berry freezer pops and ground frozen blueberries into a fresh sorbet. Aiden has been a happy taste tester for me! For the apple sauce, I simply heated up three chopped apples until they were soft and used the grinder to puree them. For the berry freezer pops, I blended half a cup of frozen mixed berries with a half a cup of water and for the fresh sorbet; just frozen wild blueberries! E-A-S-Y. Munchkin has partnered with pediatric dietitian Kate Samela, author of Give Peas a Chance: the foolproof guide to feeding your picky toddler, to help parents introduce their babies to fresh fruits and vegetables with Munchkin’s new Fresh Baby Food System – which makes homemade baby food as easy as 1-2-3.
o Step 1: Chop & Steam – Start with Munchkin’s Fresh Food Chopper & Steamer, which chops and steams food quickly with a stainless steel cutting blade and convertible lid for steaming in the microwave. o Step 2: Mash – Next, use the Fresh Food Grinder to mash food into safe-to-swallow textures. 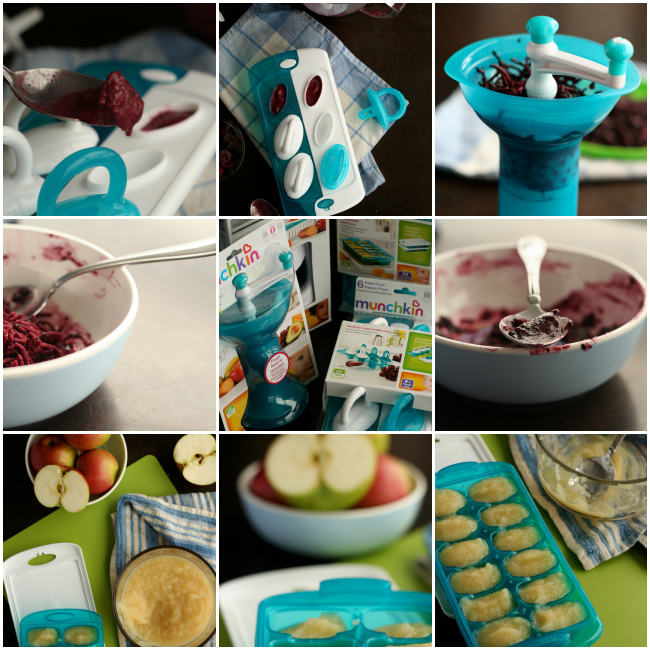 o Step 3: Store – Lastly, stock your freezer with homemade baby food in stackable Click Lock Fresh Food Freezer Trays orClick Lock Fresh Food Freezer Pops with easy-to-hold handles for little hands. 1.) Be prepared: Kate emphasizes to parents that they must be sure to have a variety of fresh foods in the house in order to make healthy meals in a flash. Even if you have the best intentions to make a healthful meal or snack, if the ingredients you need are not on hand, it’s not going to happen. Plan to dedicate a once per week (without your kids if possible!) healthy grocery outing, where your focus is on fruits, vegetables, lean proteins, and fiber. 2.) Think Fresh First: Having staples of canned, frozen, or dried items such as beans, tuna fish, vegetables, and fruits is easy to do and necessary for building a healthy pantry; taking healthy a step further, be sure to keep a variety of perishable foods on hand you know you are going to use within 3-5 days to expose your child to food in its most natural state. Your child, even at an early age, can learn how easy good nutrition is, just by watching you peel an apple from the fruit bowl on the counter, and grating it or dicing for homemade applesauce. 3.) Stick to a regular schedule: This may not seem so important, but to Kate, it remains one of the most overlooked “rules” of feeding healthy from the start. When you stick to scheduled meals and snacks, you are supporting your child’s ability to regulate their hunger, which helps them learn what it means to feel full. If you allow your child to snack or “graze” all day, they eat just enough to get by, but never really learn to eat a full nutrient dense meal. This leaves parents feeling that their kids eat nothing when it comes to dinner time! 4.) Go with Color: Pick foods that are bright in color to maximize exposure to essential nutrients and antioxidants. Rotate your colors of grains, fresh fruits and vegetables over the course of the week using the colors of the rainbow as your guide. We all rely on packaged foods or prepared foods regularly. Make it a habit to purchase packaged foods with the least amount of ingredients – if you don’t understand what is on the label, put it back on the shelf. That’s definitely advice that I can get behind! What do you think? Munchkin’s Fresh Food Chopper & Steamer, which chops and steams food quickly with a stainless steel cutting blade and convertible lid for steaming in the microwave. A Fresh Food Grinder to mash food into safe-to-swallow textures. 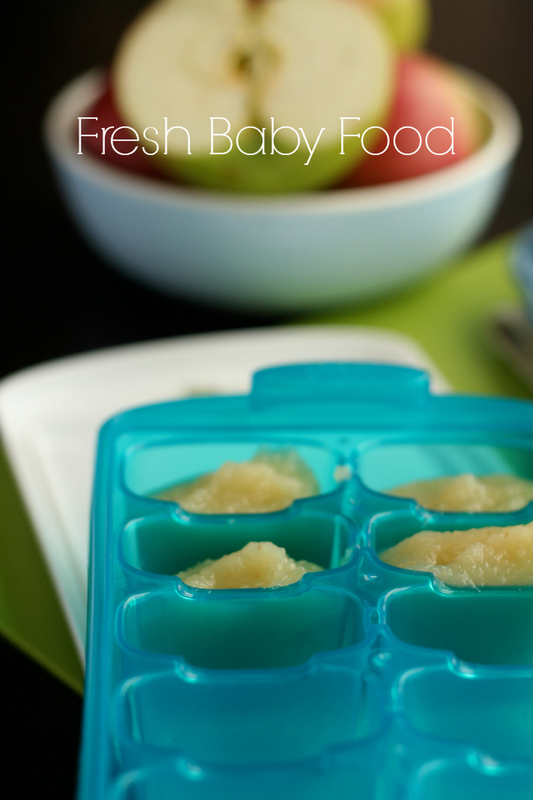 Click Lock Fresh Food Freezer Trays to securely store healthy, homemade baby food in an organized, stackable manner. The air-tight lids prevent color transfer. 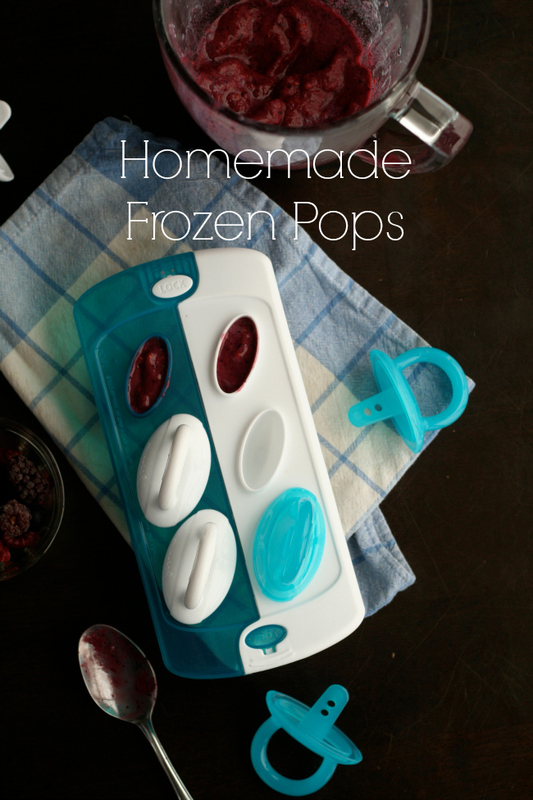 Click Lock Fresh Food Freezer Pops to store homemade baby food in the freezer and serve later in cute pops with easy-to-hold handles for little hands. *Giveaway is open to Residents of the United States. 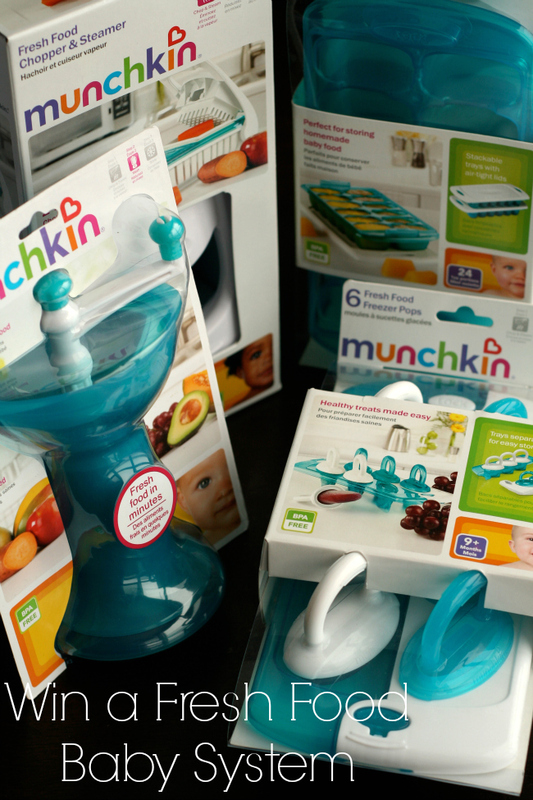 Winner will receive 1 Munchkin Fresh Baby Food System as described above (shipping is included in giveaway). *This is not a paid post, my views are solely my own truthful opinions. The products mentioned were provided for the purpose of review only. This looks wonderful! While our little one is going to be only on milk for a while now I have started looking at different ways to make baby food for when the time comes. 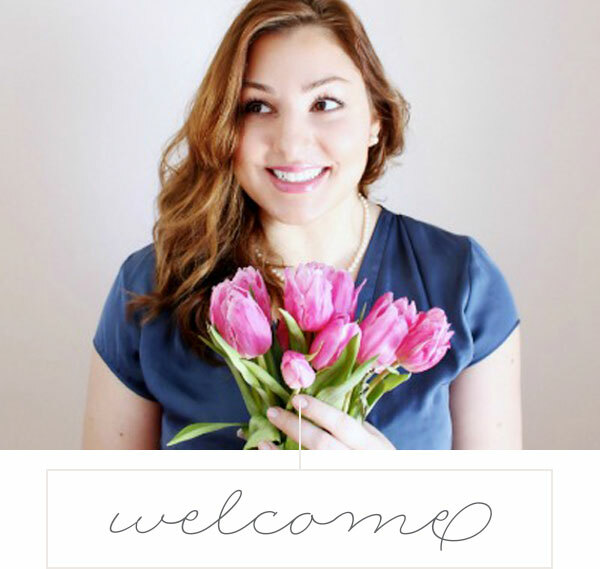 This looks super easy and something Novella would love! Thanks for sharing Emily! I have a foster baby 10 mos that I am trying to make food for and then a baby on the way… So… I have plenty of need. When my older 2 were little, I had the hand crank thingy, but I was never organized or prepared… just flying by the seat of my pants.